A couple of weeks ago, in a carpe diem moment of this, my last summer as an undergraduate bum, I found myself in the wonder emporium of my cousin’s basement. My cousin and her friends suggested we watch the prequel to The Silence of the Lambs, which is an old family favorite. I had never seen the film in question. In fact, I didn’t even really know there was a prequel. There is, though, and it’s called Red Dragon. A serial killer, nicknamed “The Tooth Fairy,” appears . . . “The Tooth Fairy” is actually a psychotic named Francis Dolarhyde who kills at the behest of an alternate personality he calls “The Great Red Dragon.” He is obsessed with the William Blake painting The Great Red Dragon and the Woman Clothed [with the] Sun, and believes that each victim he “changes” brings him closer to “becoming” the Dragon. His pathology is born from the severe abuse he suffered at the hands of his sadistic grandmother, since he was orphaned after his parents died at young age . . . Dolarhyde attempts to stop the Dragon’s “possession” of him by going to the Brooklyn Museum and literally consuming the original Blake painting. Let me break down the experience of watching this movie in a basement for a William Blake Archive Project Assistant. 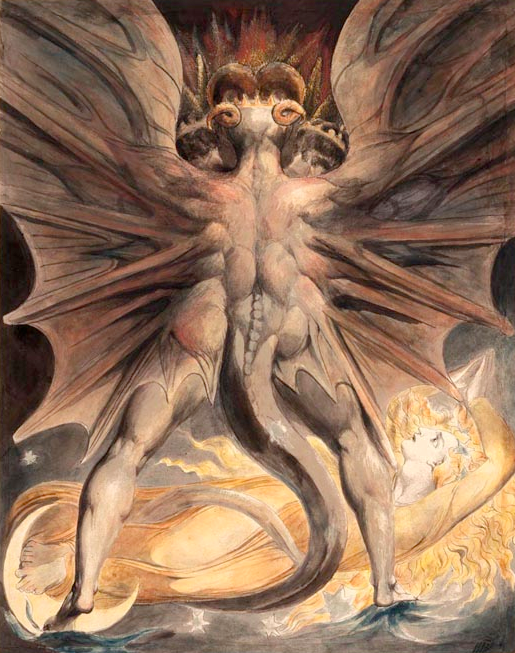 First, there was the seemingly endlessly repeating close-up shot of the painting of The Great Red Dragon and the Woman Clothed with the Sun accompanied by loud, terrifying music, the dragons’ back muscles all bulging sinisterly and his huge horns curling wickedly. This is the same painting that hangs large in poster form in our University of Rochester Blake Archive office. The winged creature (creepy in the best light, I must admit) that keeps me company while I proofread endless transcriptions of letters written by William Blake, or “Mr. B.” as he charmingly nicknames himself, compels Ralph Fiennes to violently murder entire families. The most awful moment of the film, though, for me at least, was when the Tooth Fairy dons a hipster jacket and pretends to be a PhD candidate writing on William Blake so that he can gain access to the original The Great Red Dragon and the Woman Clothed with the Sun at the Brooklyn Museum. For one brief moment, I thought I was back in my element of comfort: the scene begins with a graduate-student-looking character and an elderly librarian traversing an archive together. Then the librarian leaves, and Ralph Fiennes gazes at the masterpiece with a reverence I found easy to identify with, right before his hand darts out and he crumples the paper and stuffs it in his mouth. I was the only occupant of the basement who screamed just then. And it was bloodcurdling. To clarify, the film you describe, “Red Dragon”, is a 2002 version of Thomas Harris’s novel of the same name. It stars Edward Norton as FBI agent Will Graham, Anthony Hopkins chewing the scenery as Hannibal Lecter, and Ralph Fiennes as Francis Dolarhyde. Harris’s book had previously (1986) been filmed as “Manhunter” with Brian Cox, far superior to Hopkins, as Lecter. “Manhunter” is in so many ways much the better film even though, as Michelle Gompf points out, the 2002 “Red Dragon” emphasizes and even adds Blake connections not present in the novel.